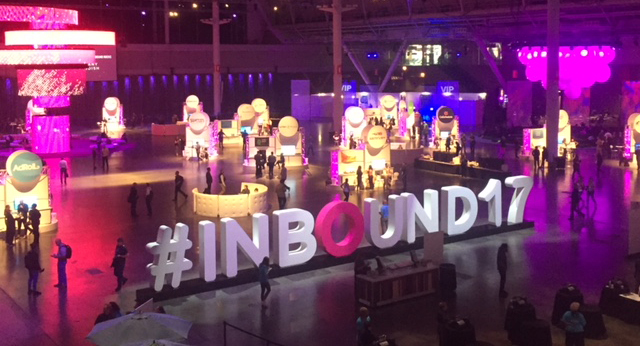 Last month Armor had the opportunity to travel to HubSpot’s Inbound 2017 Marketing Conference in Boston. With several sessions, big name keynote speakers, and the chance to meet thousands of other marketers, this was something we knew we couldn’t miss. Aside from the mega-celeb keynote speakers, Inbound offered various sessions hosted by speakers from successful marketing companies. Some of these sessions were very informative on new trends in everything from SEO, inbound sales strategies, and even general marketing/presentation knowledge. The most memorable sessions from Inbound 2017, in my opinion, were led by Karl Sakas (of Sakas And Company) and Clodagh Higgins (of Get Focused Ltd.). Besides generally being an excellent speaker, Karl really dug into exactly how to onboard new clients and how to treat them right from the start. The main takeaway from his session was to treat your client onboarding process as an equal partnership. Sure, you’re the expert so you know exactly what your client should be doing, but this isn’t really the best approach. Give your client some control over the reigns and then build your strategy off of that. Most importantly - Karl says it’s okay to push back unreasonable requests as long as you can still provide them with help and support. First of all – what great energy! Upon walking into the room she was talking with the attendees laughing and smiling. She also definitely had her squad there to cheer her on and boost the overall morale in the room. Coldagh focused on why agencies don’t succeed and the perfect formula for success. The main takeaway from her session was that inbound agencies are over focusing on the sales numbers. Instead, the focus should be on your strategy in regards to Mission and Value, Agency Positioning, and Organizational Structure. Some were good, some were not so good. My favorites were Brian Halligan & Dharmesh Shah and John Cena. Brian and Dharmesh were great, as the CEO, CTO, & Co Founders of HubSpot they gave some excellent insight as to company values to possess for success, upcoming news, and implementations for Hubspot’s CRM. John Cena’s keynote was more “started from the bottom and now we’re here.” He talked about how he stayed focused and spoke up when he had ideas that could potentially work for his personal marketing strategies. Nonetheless, his keynote was incredibly inspiring (even though you couldn’t see him the whole time ;) ). 1) Don’t go to lunch right after session end times. The lines were absolutely insane and there was limited seating. This made me late for my next session on the first day there. Luckily, I learned for the following day and was able to make it to all the sessions I wanted to see. 2) GO TO THE PARTIES. I can’t say this with enough emphasis. We networked and met some really incredible fellow marketers. In this environment everyone is much more relaxed and able to open up about insider tips for the successes of their own agencies. 3) During sessions and keynotes, take pictures of the slides. On top of taking some really good notes, the speakers occasionally went fast. So it was great to snap a picture really quick on my phone to review the slides later. 4) Lastly, don’t go cheap and GET AN ALL ACCESS PASS. With lunch from the awesome food trucks and all sessions included, this was definitely the pass to have to get the whole Inbound experience. Overall, Inbound 2017 was a fantastic time for Armor. Being among 21,000+ other marketers was something monumental in itself. We look forward to implementing all we learned and building up our HubSpot partnership. Can’t wait for next year!